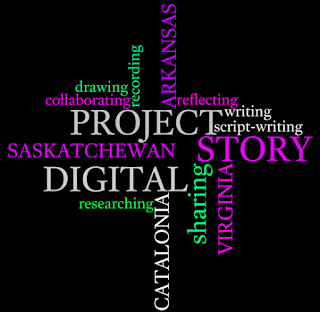 I've been working on digital stories with my students over the course of one term. I set up a project with three other schools; two from the States and one from Canada. The first step of the project, other than finding the other schools, was to work on 'Script-writing'. Students worked in pairs or in small groups to decide what it was they wanted to actually say to others. I'd say that this is one of the most important steps and yet unfortunately it's the one step that many of my students left out. Many of them couldn't decide what they wanted to say until they had their videos and photos to draw upon. In any case, script-writing and deciding where the storyline was going was my main objective for them at the beginning. Once the scripts or topics were decided, students had to go and collect the relevant photos or videos that would support their story. Some students were a bit lazy and used internet photos instead of making their own. When this step was more or less ready (Every week some groups would come to class with NOTHING...) we talked about some of the different tools they could use to make up their stories. Many of them started with Moviemaker and then finally heeded my advice and used an online digital storymaking tool called Stupeflix. Others had the excuse week after week that they couldn't work in class because their work was saved on THEIR computer at home and couldn't be saved onto a pendrive for who knows what reason. I heard so many excuses! They were finally able to download their photos and videos, from home or from the class. We did most of the voice recordings in class using audacity. Stupeflix doesn't allow you to record your voice directly but it does allow you to upload sound files. Some students went out into a quiet hallway and recorded their voices using their mobile phone voice recording tool. And of course, some students never got to the recording stage and ended up just putting writing onto their stories with no voice. Considering how reluctant teenagers can be and how limited we were with time, internet connection, tool choices, etc... I am happy to have finally completed the project. Some stories are better than others but they all got them done in the end. The other schools also put up their stories on the web and we dedicated two classes to looking and listening to the other stories and having them go to their student wiki to write comments and feedback about the other schools' stories. All in all, it's been a steep learning curve for both the students and teachers. It's not always easy to organize a collaborative project and to keep everyone on track in the way in which you imagine but I do think that projects like this are worth it. Along with the language-learning factor, they have definately had the opportunity to try out some web tools and new technologies. I'd love to hear your comments about the website and stories in general. Please enter the site and comment!